So yesterday I wrote about my plans to adjust to my toddler’s lack of napping and today talking to my mom I realized that the option of running with my toddler playing in the basement would be my best option under one condition. I have to turn my treadmill around. How funny is it that I never thought of that? Right now it faces a shelf so I can watch my laptop (Netflix) while I run, but that leaves my back facing the play area. If I just turn it around, I’m facing Lillian’s play area and can then put the laptop on a bar stool or dresser to watch my shows. I really have to laugh at myself sometimes. I was stressing out about how to manage all this and the whole time all I had to do is turn the silly machine around. Serious mom brain issues here! Sisterly love – Katrina trying to flee. Today I tested out the Lillian not sleeping since she actually left her bedroom during my run and I heard her so I brought her downstairs to the basement and finished my run. Lucky for me she climbed right into the arm chairs and watched Treehouse while I finished running. I only had 0.6 miles to go today, but tomorrow I will have to go further. I still think she’ll be fine. There are loads of toys to play with in the basement. Luckily I only have to deal with it tomorrow and then I can have two weeks of only Katrina (while Lilly visits Oma) and my hubby being off work to get a lot of good runs in. I hope to do a lot of outside running so I get used to being out in the cold and then I should be able to get the girls out more. 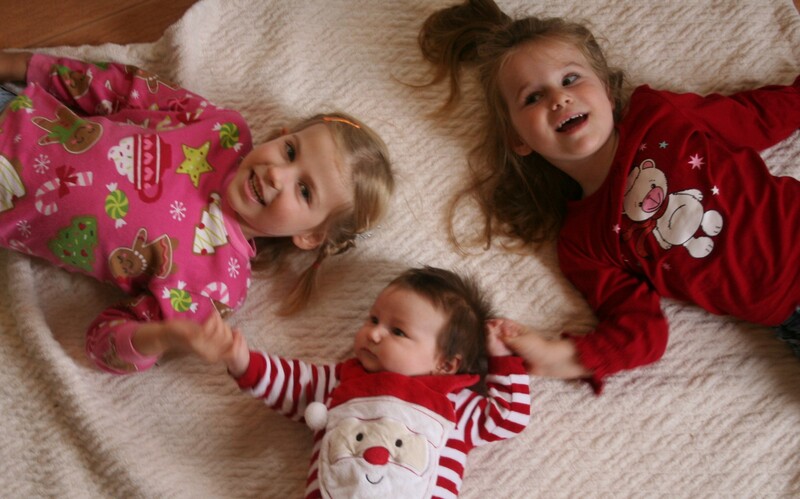 Sisterly love – baby is not mobile so Lilly gets her. I just can’t believe that my baby doesn’t want to nap anymore. She is SOOO cranky at night when she doesn’t nap and honestly is a real pain, so I wish she would sleep. Today we even went out for an hour and a half walk and she ran around in her snow suit and boots but even that didn’t make her sleep. So I’m not sure how to get her to sleep. I know kids outgrow their naps but everything I’ve read says they have to be happy all evening and NOT get super cranky at dinner, which she does. So she should still be sleeping but nothing I do seems to work. But that’s life! Any mom’s out there have tips on how to get toddlers who don’t want to nap to go to sleep?